Price is per 2 beads - each a large 25mm x 18mm and top drilled ready to thread. Dyed light purple - but colour fixted. Moonstone’s characteristic feature is a magical play of light. Moonstone is translucent, and softens the light shining through it to give a pearly moon-like glow appearing different whenever the stone changes position. Years ago it was thought to be brought about by the moon’s phases. This shimmering effect is caused by light being refracted inside the stone and then scattered. Moonstone comes in colorless, white, grey, and subtle yellow, but always has a blue or white sheen. Rainbow moonstone is colorless with a blue sheen and a rainbow-like array of colors. Mystery surrounds moonstone. In India it’s considered sacred to lovers, and is also known as a dream stone bringing beautiful dreams. In Arab countries women sometimes wear moonstone as a symbol of fertility. It was also believed to be especially protective to seafarers, who have used it since ancient times. During full-moon, moonstone is very powerful for reconciling love - and as the moon decreases, is said to allow one to foretell the future. 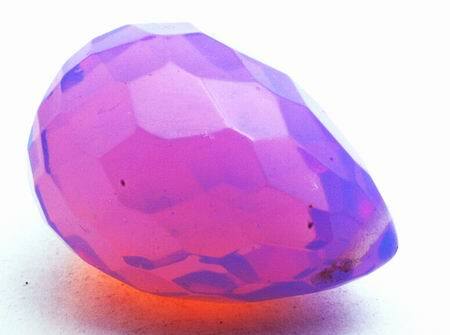 A feminine stone for female issues and the inner-child - but also used by men who want to reach their feminine side and to understand dreams. Moonstone brings confidence, calms the emotions, and aids spirituality and intuition. Also thought to protect against fever, fluid-retention and urinary problems. Its soft shine will support the emotional and dreamy side of a person. Wearing moonstone also increases your sensitivity for others. Classical moonstone from Sri Lanka shimmers pale blue, and is now rare, so expensive. Moonstone from India has a cloud-like play of light on beige, brown, green, or orange backgrounds ?and some have a cat’s eye or a multi-layed star. Natural uncut moonstone is dull without the play of light, which is brought out by the cutter’s skills. Classical moonstones are always cut as cabochons. The price of moonstone depends on many factors. Intense color, and the larger and more transparent the stone: the more value. Top quality fine blue moonstone shows an incredible three-dimensional depth of color, which is only visible when tilting the stone. Brighter colored Indian moonstones and opalite moonstone is cheaper. Opalite moonstone is most common today. This is a synthetic stone looking similar to genuine moonstone that's only been around recently. Against a light background, the stone changes to a milky bright icy-blue with a golden glow of other colors. The pastel glimmer is soft and captivating. This flamboyance makes opalite ideal to wear during a night out on the town. Opalite always looks refreshingly cool, whether it's milky-white or flashy-blue - ideal for summer jewelry. By being creative with your outfits, you can really have fun wearing this stone. A beaded belt made with opalite, for example, can become the perfect summer accessory to a brightly colored evening dress. Moonstone is fragile and should be handled carefully. However, a jeweler can polish a dulled moonstone back to its original glory.